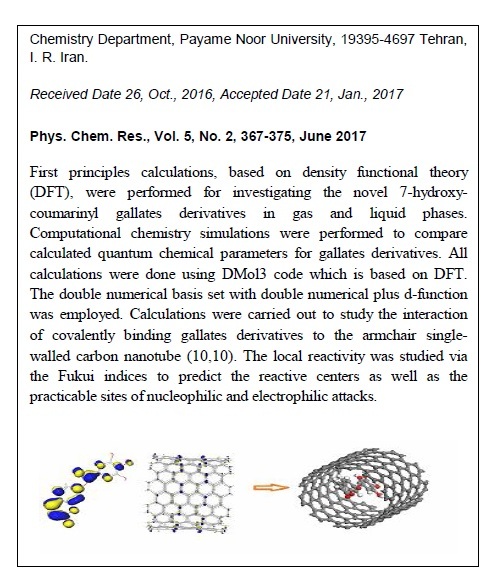 First principles calculations were carried out for investigation the novel 7-hydroxycoumarinyl gallates derivatives in gas and liquid phases using density functional theory (DFT) method. 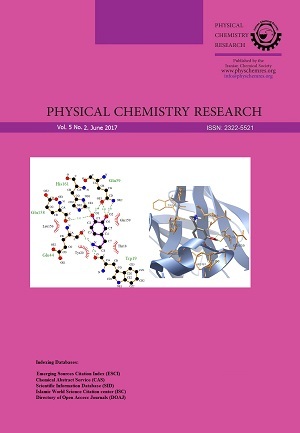 Computational chemistry simulations were carried out to compare calculated quantum chemical parameters for gallates derivatives. All calculations were performed using DMol3 code which is based on DFT. The Double Numerical basis set with double numerical plus d-function (DND) was used. Calculations were carried out to study the interaction of covalently binding gallates derivatives to the armchair single-walled carbon nanotube (10, 10). The local reactivity was studied through the fukui indices in order to predict both the reactive centers and the practicable sites of nucleophilic and electrophilic attacks. The adsorption energies, the quantum molecular descriptors analysis and the structural changes at the adsorption site are indicative of chemisorption on the armchair single-walled carbon nanotube (10, 10) surface. The HOMO and LUMO are witness to the substantial changes in the electronic properties of the SWCNT systems. Adsorption energies indicate that 7-hydroxycoumarinyl gallates derivatives are physicosorbed on carbon nanotube (10, 10). This property enables the delivery of these derivatives with anti-cancer potential from the nanotube at the targeted sites. These results are extremely relevant in order to diagnosis the potential applications of carbon nanotubes as efficient boats for targeted drug delivery.